Official report on Fukushima – what can South Africa learn? 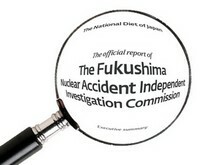 An independent in depth report on the Fukushima nuclear disaster commissioned by the Japanese parliament was released in July 2012, and it comes to some very important conclusions. As Eskom attempts to get approval to build three more nuclear plants along the southern coast, South Africa should be looking very closely at this report to see if there are lessons we should learn from it. The earthquake or the tsunami?